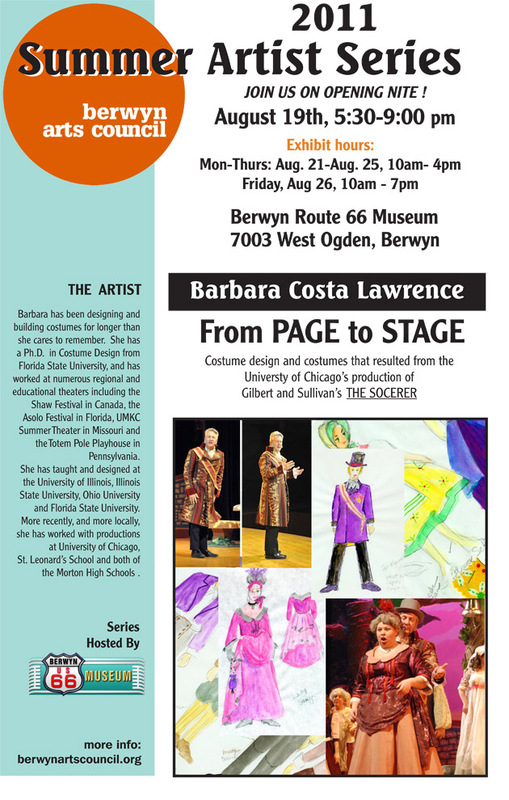 The Berwyn Arts Council continues it's Local Summer Artist Series this summer! 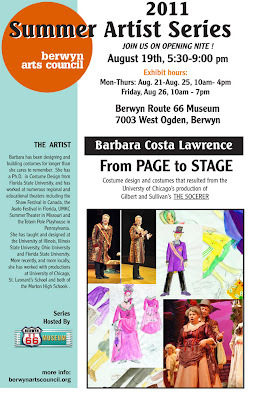 The show will be on Friday, August 19th, 2011 at the Berwyn Route 66 Museum (7003 West Ogden Avenue, Berwyn IL 60402). The show will start at 5:30 PM and will end at 9:00 PM that evening. The show will be available to view for the public through out the week! Barbara has been designing and building costumes for longer that she cares to remember. She has a Ph.D in Costume Design from Florida State University, and has worked at numerous regional and educational theaters including the Shaw Festival in Canada, University of Chicago, both Morton High Schools and many more! Stop by the kickoff of a new food truck gathering series in Grant Park, hosted by Mobile Cuisine Magazine and the Chicago Park District. Mobile eateries Taqueror Fusion and Bergstein's NY Deli are confirmed for now, but keep up with additional participants by following @mobilecuisine on Twitter. 5-8 pm Friday. No cover. Walk through a mini city of art galleries houused within 12 shipping containers at the inaugural Built Festival. Galleries range from photography and screenprinting to elaborate installations and performance art. Local musicians perform, including sibling rock duo White Mystery and Beat Kitchen serves up food. Browse through hjome decor, candles, jewelry, stationery and more from crafters at the Indie Arts Market. With an impressive list of artists from the Chicago area, see how many items you can spot with the Chicago flag stars on them. Celebrate the best of guerilla cuisine. Local photographers’ and painters’ works inspired by urban living fill Galleria Marchetti’s space, with many of Chicago’s favorite food trucks parked in a nearby courtyard. Check out what to expect at this first-of-its-kind fest Sunday. Macy’s Chefs A-Go-Go mobile eatery food tour, featuring celeb chefs, makes its only Chicago stop with Chef Takashi Yagihashi whipping up summertime recipes and handing out free bites. Arrf Scarf, Bergstein’s NY Deli, Forever Yogurt, Uptown Pie Co. and Puffs of Doom carts also provide food for thought. Lynn House, chief mixologist of Blackbird, will host a private mixology demonstration for VIP ticketholders. Of course, House will offer samples of her creative concoctions. Photographer Geraldine Rodriguez takes on a tasty challenge during a live photo shoot of a model dressed in couture made of nostalgic candy as part of the "E.T. Meets Willy Wonka" showcase title. A silent auction takes place throughout the event to benefit Chicago Street Musicians, Common Threads and The University of Chicago Charter School. Tap sensation Madd Rhythms brings the house down—and probably leaves behind a few dents in the floor. The group celebrates 10 years of tap by continuing to cultivate some of the best tap dancers in Chicago. See the best local street performers take the stage this weekend as nonprofit Chicago Street Musicians provides entertainment throughout the fest. 1-minute video, PROJECT HARAMBEE, was selected as one of the top 50 videos in the American Airlines Flights, Camera, Action video contest! Now, with your help, the project can win prizes to help their projects in Kenya, Zambia, Rwanda, & Uganda. Don’t need $$ for this, but do need a minute of your time. Your vote will improve the lives of people affected by HIV in Sub-Saharan Africa. AA allows one vote per email per day through August 25. You'll get an email to confirm your vote. You only have to click on it once...no more work! Thank you for supporting Project Harambee, and please help spread the word. and award 2 free round trip tickets to Africa to visit our programs there. Visit Oak Park is hosting artists outside of the Oak Park Visitors Center (1010 Lake St, Oak Park) during Art al Fresco this summer, and they are trying to get the word out to artists who live in the 21 communities that comprise VOP, which includes Berwyn. In a nutshell, they can accommodate up to 4 artists on Thursdays (4-7pm) and Weekends (11am-4pm). Their season officially ends on Thursday, August 25th. There is a $25 entry fee, and sales are run through the Visitors Center with a 25% consignment structure. This event is juried. They got a late start this spring with planning this event, so they hope to begin planning in late January/early February for Summer, 2012. Any questions/inquiries should be directed to Bernadette at info@visitoakpark.com or 708.524.7800 x105. Note: Thursday, August 25 is full, and they believe the weekend of August 13-14 is as well. Bernadette can confirm that. They are are thrilled to be able to showcase the artistic talent in our area!